Directweblinks.com is the PUP that uses misleading techniques to prevent removal. Use Reimage to locate malicious components and get rid of them faster than with uninstall instructions. A full system scan blocks virus reappearance and prevents traffic to malicious domains. DirectWebLinks.com is a highly suspicious domain that suggests adding an update.exe program. Once executed, this program can modify browser's settings or add unwanted extensions in order to affect user's browsing experience. 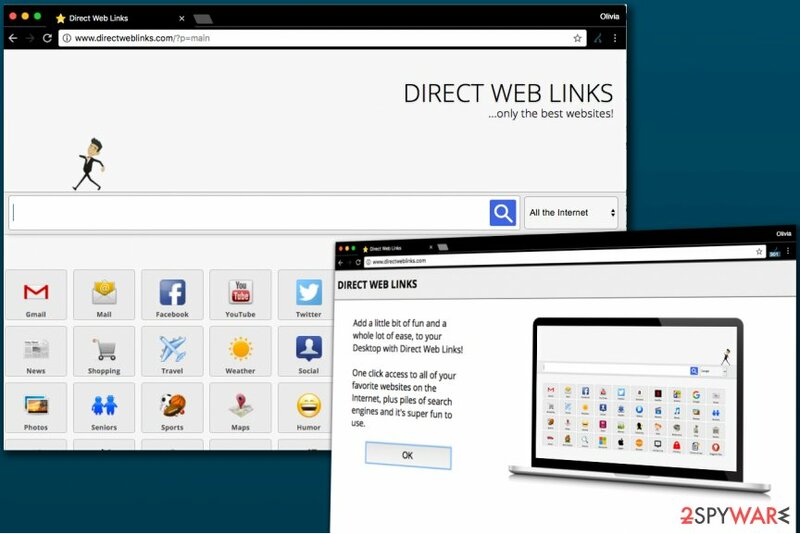 First of all, Direct Web Links virus changes homepage and search settings, adding directweblinks.com/?p=main value to them. Cyber security professionals recommend removing this potentially unwanted program (PUP) as quickly as possible. The search engine provided by DirectWebLinks.com virus tries to catch users’ attention by offering ultimate search capabilities. In other words, the developers promise you that your search queries will retrieve most relevant information. However, the site instantly transfers user's search queries to Alltheinternet.com search engine which also presents the search results. This is where you will have to encounter annoying ads presented as search findings. Though the search engine offers you banner-free services, note that promoted sites might not be always secure. 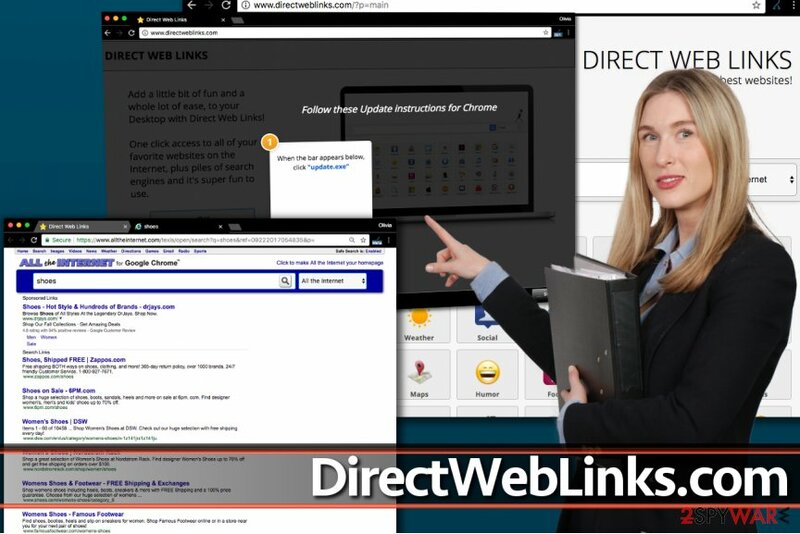 IT experts have labeled it as a browser hijacker, so Directweblinks.com removal might be a better decision. Direct Web Links ads will be presented as “Sponsored links” in the results' pages. We strongly recommend you to avoid clicking on these results as they might unexpectedly reroute you to potentially insecure domains. If you value your privacy and security, remove Direct Web Links redirect virus without any hesitations. The main page of DirectWebLinks website presents multiple categories, which divide again into subcategories. For instance, if you enter movie section, additional choices of YouTube, Netflix, Rotten Tomatoes, CBS, and others, will appear. Considering the suspicious activity of Direct Web Links adware, we suggest removing it from your computer. If you installed the software without realizing its real function, do not hesitate and use the instructions provided below the article. You could also install the software unknowingly alongside another free program. 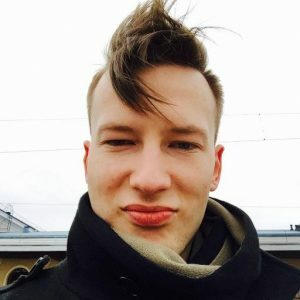 Such distribution method simply is yet another reason to remove Directweblinks.com. Reimage or Plumbytes Anti-MalwareMalwarebytes Malwarebytes helps you in this process. DirectWebLinks.com virus is a highly annoying program that serves Direct Web Links pop-up ads and also injects paid entries into search results. Note that even Skype and Java may contain irrelevant add-ons, so you should be wary of the PUPs. If you pay attention, you will likely to escape Directweblinks hijack and infiltration of similar programs. Note that the browser infection might be promoted in sponsored domains in the form of scripts. In order to get rid of them, check the below section. You can remove Directweblinks.com virus manually by resetting the browser and deleting the update.exe file. In addition, it would be wise to eliminate all other files and programs associated with the browser hijacker. Further removal instructions are provided below. There is also a more optimal solution. You can perform Directweblinks.com removal with the assistance of malware elimination tool. Note that the hijacker might be promoted in Chinese or Japanese sites as well. Check what program was installed once you launched the update.exe file. Uninstall it using the provided instructions. In addition, find and delete the update.exe file as well. Here, look for Directweblinks.com or any other recently installed suspicious programs. Wait until you see Applications folder and look for Directweblinks.com or any other suspicious programs on it. Now right click on every of such entries and select Move to Trash. When in the new window, check Delete personal settings and select Reset again to complete Directweblinks.com removal. Once these steps are finished, Directweblinks.com should be removed from your Microsoft Edge browser. Perform full browser reset to eliminate all Directweblinks components. Here, select Directweblinks.com and other questionable plugins. Click Remove to delete these entries. Now you will see Reset Firefox to its default state message with Reset Firefox button. Click this button for several times and complete Directweblinks.com removal. Here, select Directweblinks.com and other malicious plugins and select trash icon to delete these entries. Click Reset to confirm this action and complete Directweblinks.com removal. Here, select Extensions and look for Directweblinks.com or other suspicious entries. Click on the Uninstall button to get rid each of them. Here, look at the Homepage field. If it was altered by Directweblinks.com, remove unwanted link and enter the one that you want to use for your searches. Remember to include the "http://" before typing in the address of the page. Now you will see a detailed dialog window filled with reset options. All of those options are usually checked, but you can specify which of them you want to reset. Click the Reset button to complete Directweblinks.com removal process. ^ What Can Marketers Do About Ad-Blocking?. SearchEnginePeople. Best Digital Agency SEO. ^ Over 200,000 Wordpress Sites Infected With Plug-in Malware. Koddos. Informative News blog for focus on Hacking, Information Security, Cyber Crime, and Privacy . ^ Terminate malware. Uirusu. Spyware and security news. This entry was posted on 2017-09-22 at 05:20 and is filed under Stealing programs, Viruses. You can quickly scan the QR code with your mobile device and have Directweblinks.com virus manual removal instructions right in your pocket. How did you remove Directweblinks.com virus?